Stormwater runoff is rain water that runs off of hard, impervious surfaces like streets, roofs or parking lots, then flows into ditches or storm drains. Along the way this runoff collects sediment and pollutants like oil, paint, pesticides, fertilizer, pet waste, and car washing soap. These pollutants are unhealthy for humans, and can be downright toxic to plants, people, and fish, even at low concentrations. Nutrients from fertilizer runoff cause algae blooms that kill fish by using up oxygen in the stream water when the algae decays. Decaying grass clippings also use oxygen in stream water making it unavailable to fish. Bacteria and pathogens from animal waste can create health hazards for people. This polluted water is not processed by wastewater treatment plants, instead it flows right into Bear Creek, and then into the Rogue River. It’s actually the #1 source of pollution in those waterways! Stormwater runoff can be heated up as it flows across impervious surfaces. 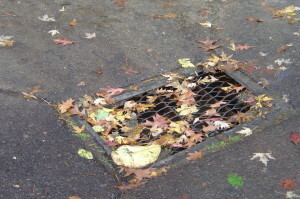 Think about how hot your driveway can be in August, and now imagine rain from a summer thunderstorm running down your scorching driveway, into a street gutter and then down a storm drain. That runoff could be quite warm and will flow directly to the nearest creek. Unfortunately, salmon need cold water in order to survive. Did you know that salmon prefer temperatures below 20◦C or 68◦F? Too much stormwater dumping all at once into our creeks is also problematic. Before we built cities, rain water soaked into the ground and replenished our ground water supplies, only after the soil was saturated did stormwater flow off into streams. 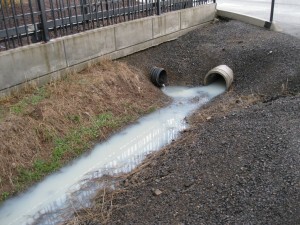 Today, stormwater almost immediately runs off into streams because it can not soak into the ground. Consequently, too much water enters the creeks at one time, which results in flooding, erosion of stream banks, and scouring of streams beds, damaging habitat. That’s why we need to let more rain soak into the ground, as it was meant to! A key part of being Stream Smart is remembering everything going down storm drains flows directly into Bear Creek and the Rogue River with no treatment. We all live downstream, so allow rain water to soak into the ground at your home or business and ensure that any stormwater runoff from your property is cool and clean because that’s Stream Smart! For Home and Business Owners: Our Catching the Rain page provides Stream Smart ways to manage stormwater at your home. For Developers, Engineers, and Architects: Our Low Impact Development page provides information on Stormwater Management requirements for the Rogue Valley. For local stormwater regulations and programs visit the links to different agencies on the page you can find on the About Us menu .